What a great first convention! Forks, Washington, is definitely on the comicon circuit now. Evan Sveum of Home Slice Pizza and Comics - how fitting - did a wonderful job on his new RainCon. As usual, I have my posting of me wearing my Ka-Blam Tshirt, with my very first RainCon customer. If you need quality Print-On-Demand that will let retailers buy at nearly-'80's prices, it's the place to go. And readers can do the same at their store front at Indyplanet. 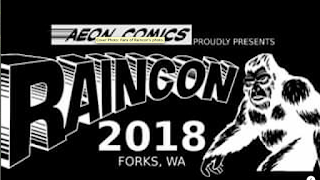 And here are many more Raincon photos! I wanted to listen to the lecture, but there were so many interested people I had to pay attention to, at my table. Friday was definitely rocking. The Italian sodas were on sale at the table to raise funds for the LaPush Hallowe'en haunted house. The milk in the sodas came in handy for a calcium boost, and they added sugar-free options. I've heard the haunted house is in its third year, and will scare the teeth out of your head. The monsters practice all year - and are very professional. No, I don't want to go. No, I will not miss it. I hate and love haunted houses dearly. All sorts of gaming going on - and the full-on tournaments started after the nightly movies, and ran until 1:00 am, Friday and Saturday. I don't game myself, but I used to do gaming illustrations, especially for Steve Jackson, and have some fun stories, including my "Pirates of the Caribbean stole my dialog!" story, involving Steve's Lego Pirates games at a long-ago Miscon. Oddly enough, Alice Ryan, who ran the great Steampunk table, says that was her very first con! Serendipity. Of course we had cosplay. Did I get good photos of the contest? No, I was helping judge it. 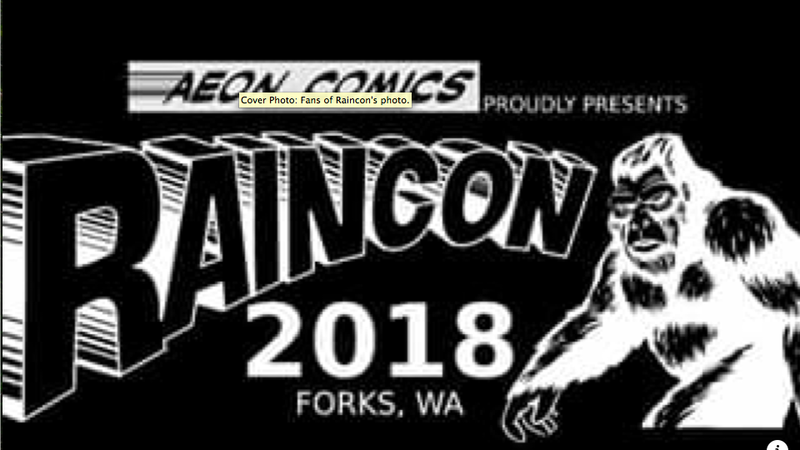 Look around Facebook for Raincon photos. Quite the good turnout for a very first convention. 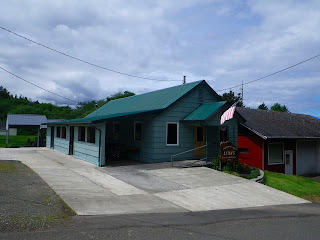 Friday evening, the movie was Rocketeer, which I missed to head back to Clallam Bay to get some sleep. Since my sleep was choppy, and I had to end up napping in a back storage room on Saturday anyway, I might as well have stayed. Saturday, the movie was Guardians of the Galaxy. I'd never seen it big screen, and caught the moment when Chris Pratt's ship flew up on a column of water - and ran into the camera lens. Too funny. Ended up eating too much pizza, including Home Slice Pizza - especially their darn wonderful chicken-and-artichoke - and Mexican ice cream from the shop down the block. Helped a scared local kid to come out as a nerd and a furry: "Wear what you want; nobody's going to point or make fun of you." Alice Ryan's steampunk table provided his first pair of ears and tail. By the end of the show, he was running around with his little fake fox tail, perfectly at home. It was great. Welcome to our family. And everybody else, too - because tables are selling for 2019, already. If you're on the way to the beach, drop in for an hour or so. We'd all love to see you.